Many of the Eagles top players return as the team gets set to play Germany later this month. There were some questions whether the likes of Samu Manoa would be available but he's on the roster along with Andrew Durutalo, Tony Lamborn, Marcel Braches, AJ MacGinty, and Blaine Scully. Missing from the roster this go around is Titi Lamositele, Chris Baumann, and Joe Taufete'e, all of whom have slight knocks or more serious injuries. Overall, it's as close a full-strength line-up as they are going to get at the moment. UPDATE: Joe Taufete'e and JP Eloff have been added to the team. With new/future head coach Gary Gold still with Worcester Dave Hewett will lead the team out as interim head coach. Greg McWilliams, David Williams, and Shawn Pittman will be the assistant coaches. The match is scheduled for November 18th. Dave Hewett - so whats the deal? a short term contract or is he going to be part of gary golds team? 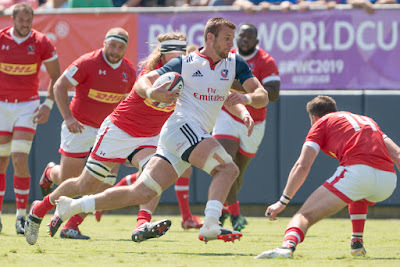 is he going to be doing more things with usa rugby?